and weigh only 5.5 ounces. Combing takes time. But it's so darned relaxing. When you don't stab yourself. And the resultant top, oh my oh my, such a nice preparation. And since I don't have specific plans for it anytime soon, no rush. 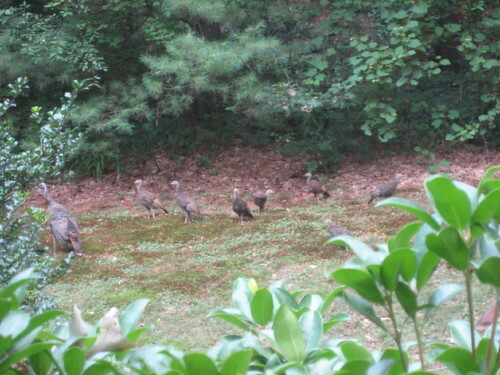 A few weeks ago there was a gaggle of turkeys in our front yard. A big one followed by 10 or 11 little ones. I chased them down the street with my camera (they stayed in the bushes, I followed along the road) but they were fast. A couple of weeks ago I had to stop on my drive home to let them cross the road. They're quite camera shy and are retreating to the left. They crack me up and tickle my city girl funny bone. I'm off to Montreal. Enjoy your weekend! What can I say, my fleece muse is unpredictable. And powerful. I "won" the CVM fleece (California Variegated Mutant - what a name, eh? Should be on X-Files.) on eBay. 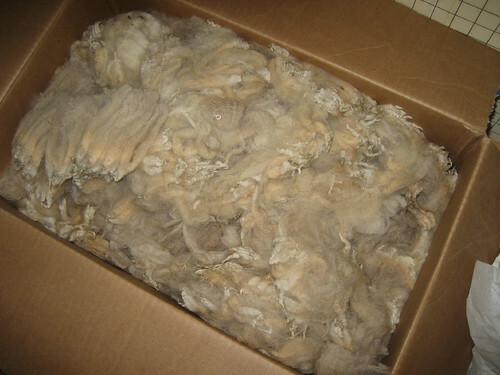 Now, I don't generally recommend buying fleeces sight unseen. It's hard enough (for a newb like me) to pick out a fleece in person. But over the 'net, that much harder. You can't inspect the locks, you can't test for breaks or see if there's a lot of vegetable matter, check for second cuts, etc. It can be a crapshoot. But, as I said, my fleece muse is unpredictable. And powerful. I've heard a lot of good things about CVM and have been wanting to try some out. 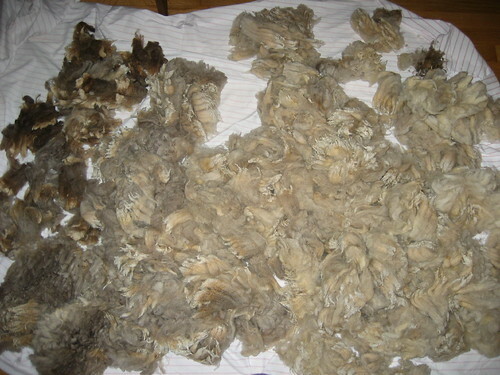 The seller had another auction for a fleece that won grand chamption at their county fair. I know, I know, I don't even know what that means. It sounded good. But I did read through their eBay feedback and it was good. 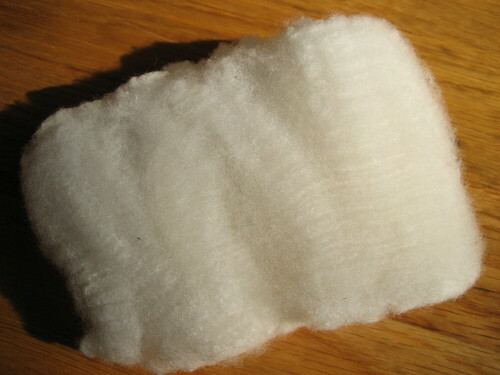 Bonnie even included some angora because of a small billing confusion. She was super nice and the fleece arrived very quickly! It does have a very fine crimp and is quite soft. When it arrived, it was a scorcher, and the lanolin was kinda liquid in my hands. Ever have that happen to you? Kinda weird. CVM's are Romeldales (but not all Romeldales are CVM's) and were specially bred for their colors. There aren't too many of them around, and I think the fleeces are generally on the finer side, so they're also rather pricey. I wasn't sure what to do, but I knew I wanted to separate out the colors. If I combed or carded the locks willy nilly, then the colors would blend and average out, and I'd lose the range. the last of it - done! I think I overcategorized. After a while it was hard to figure out into which batch the locks should go. See what I mean? You can hardly tell the difference! 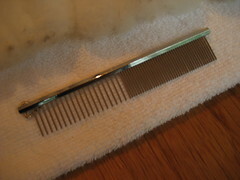 While most locks were quite soft and had a staple of about 4", some were coarser, and some here and there were shorter. Quite natural in a fleece, I think. There were small bits of second cuts, but they were easy to separate out. I considered sorting out the coarser and shorter locks, but the overcategorization was making me dizzy. I might go back and do it later. I brought some to work to photograph. See the color gradations? In't cool? you can hardly tell. Below is the slightly darker one, look how much lighter it looks brushed! It also looks a bit yellow at the tips. Not sure what that's from. A sweater with some fair isle or multi-color detail utilizing diferent shades, and probably dyed as well. A lace shawl that gradually goes from lightest at the top to darkest at the bottom. I'm sure I'll come up with more as I play. Kim sent some samples so I could get an idea. Samples are a good thing, people! 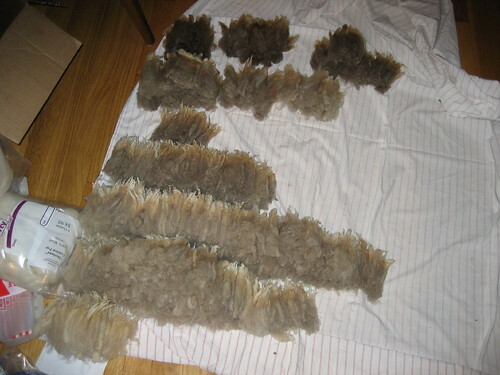 Since her fleeces were all sold, she sent me some "seconds" from the bits that are skirted out of the sold fleeces. I think they look great. Look at the crimp and color! I especially like the dark grey one at the bottom. Now don't you want to get a CVM fleece?? 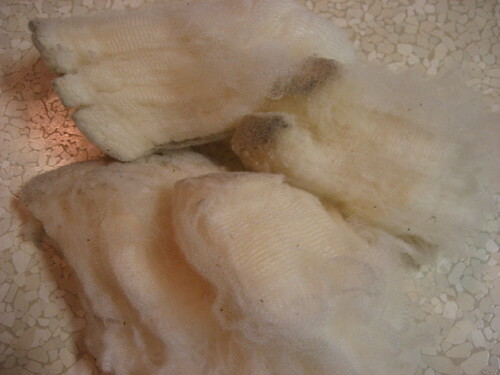 * Edited to add: sheepshepherdess's comment reminded me: the fleece was very clean with very little vegetable matter. It was indeed well-skirted and the waste when sorting was very minimal! Also, Ana sent me a link to an article in Sheep! magazine written by Bonnie at Sheepy Thyme Farm, which I enjoyed reading. They really care about their sheep and fleeces! Based on feedback the other day, I'm trying to comb it with the Forsyth combs. We'll see how it goes (initial attempts are so-so). Love the colors. 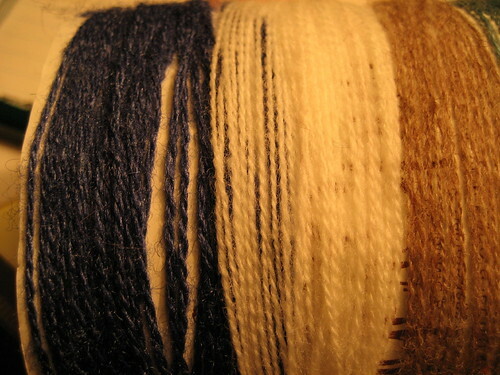 The plan is to spin the other 4 oz which is a different (hopefully complementary) colorway, and then ply them together. 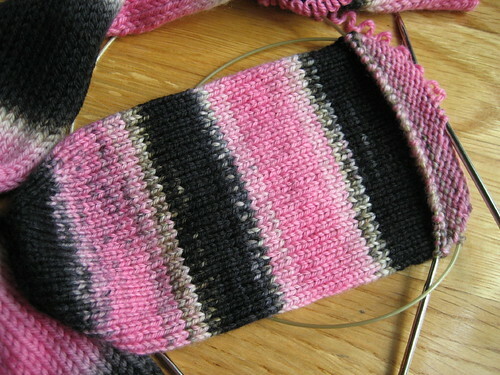 The second pink band had much less black dye drool on it. I think both bands are interesting. The yarn feels soft and squishy while knitting. It's the actual yarn called for in the pattern, which is so rare for me. 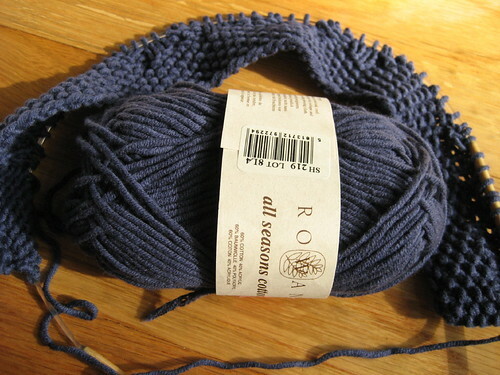 I bought a few skeins specifically for this project at that yarn closing sale back in April. Anyone know if the All Seasons Cotton stands up to the washer and dryer? It didn't rain at all, all day. I looked for pigs, but didn't see any. I wouldn't have been so shocked. Remember that fleece I bought at MDSW? Remember I wanted to spin laceweight with it? 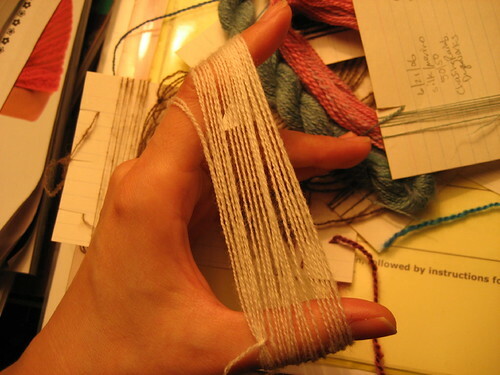 Ya, ya, ya, spun the laceweight. Tonight. Well, just a bit. A sample. And to do that, I had to wash it. And figure out how to prep it. 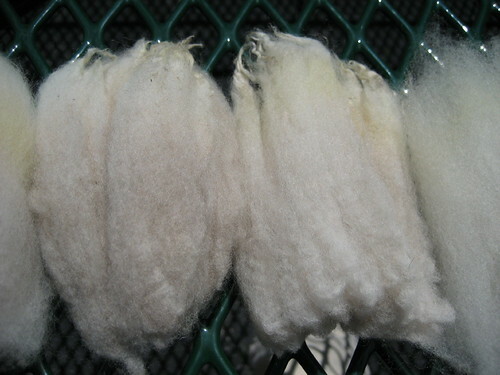 Spinning stuff you've washed and combed is SO different than spinning commercially processed top. 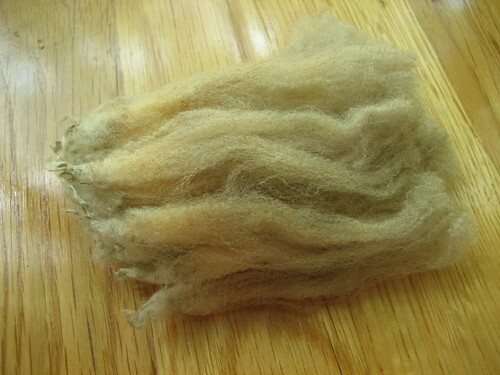 For one thing, you've still got all this crimp and energy in the fiber, it's not stretched out and flat like top. For another... well, I don't have another. It's a lot sproingier, not as slippery. It's nice. 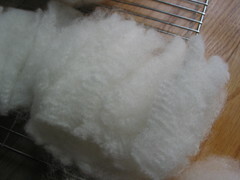 I saw this article on washing fleece a few weeks ago and bought some tulle. Didn't use it. 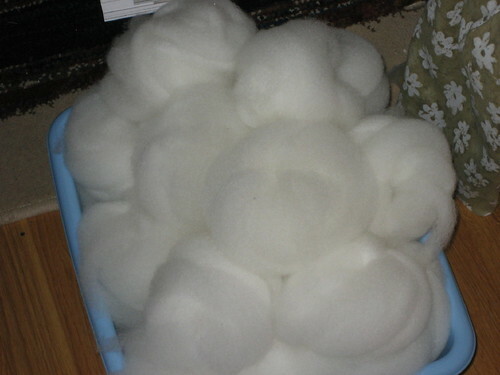 Thursday, I read Spinnerella's post on washing fleece and decided it was time. 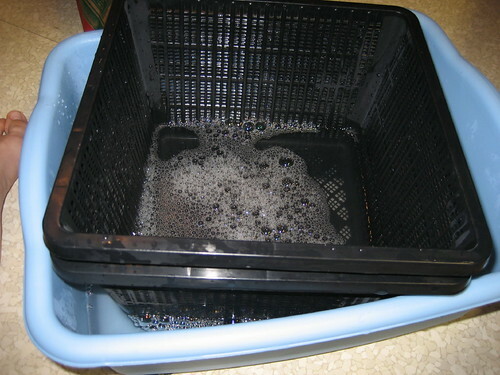 I don't have the sink or baskets she does, and wanted to try the warter basket method anyway, so I did that first. 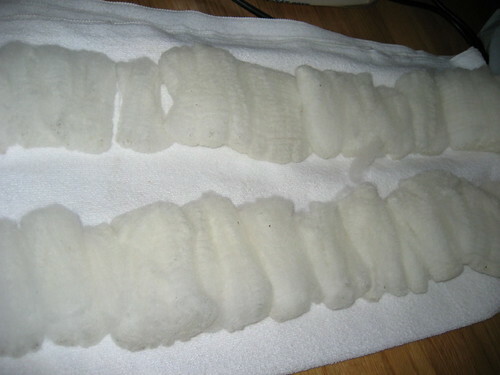 I only did one hot water wash, and it wasn't quite enough, as I could feel a little stickiness in the tips. It wasn't easy to remove the excess water, the wet locks on their own were a little awkward to handle. 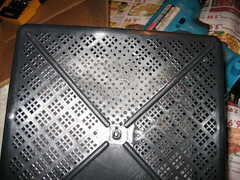 Also, they kinda stuck to the warter basket a bit where the basket's sticker had been. 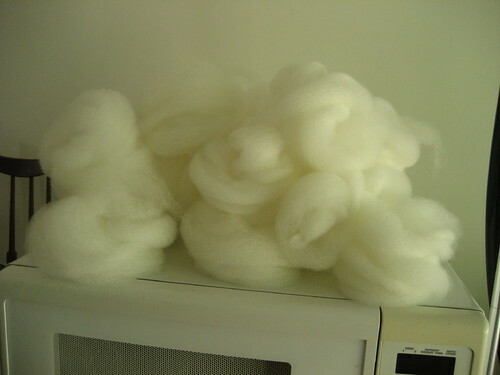 For a coarser fleece, it probably wouldn't be so bad, but for this superfine, easy to felt stuff, not good. I thought, a netting barrier ought to help. But, the size and shape of the fleece severely limited how much I could stick in there. 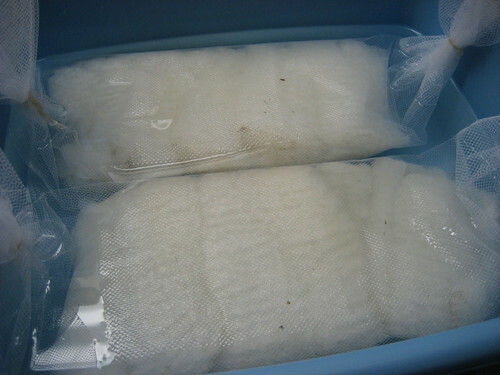 Instead, I placed some fleece in the netting, rolled and tied, and placed in the bucket. The vinegar in the first rinse was KEY, it cut the suds big time. The use of baskets in her post, also KEY. Too bad I couldn't do that this time. I had to lift the netting sausage out by the ends, and that made the fiber slide around a bit. Upon later inspection, the cut ends of the locks got a bit felted from rubbing against the netting. Next time, I will orient the locks parallel to the sausage. Or use baskets. Man, stuff is SOFT. Soft, soft, soft. Sproingy. Soft. Did I mention it's soft? I kept going back to touch it. 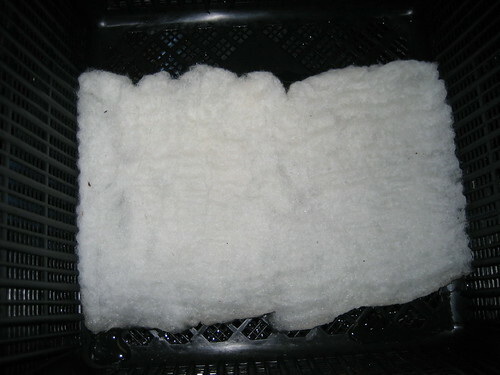 Pre-wash, it's got so much lanolin, you wouldn't know this was underneath. 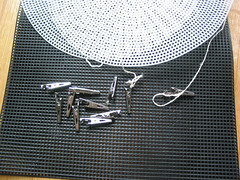 I also worried that the super sproingy-ness would not work well with the combs. I thought the fibers might stretch out and spring back into little knots and neps. It might be a mess. Then I made a connection. My brother bought me some awesome spinning DVD's for my birthday (woohoo!) and in "Handspinning: Advanced Techniques", Mabel Ross combs some merino with an actual comb. What if that's what those Foxhill Farms people meant? The ends did sproing a bit, but overall it went fine, if a little slow (esp on the slightly felted end). I created a ... roving? by pulling from one corner and gently stretching, similar to in the DVD. And spun. Laceweight. With the cormo. Ohhhh yeaaaaahhhhhh. 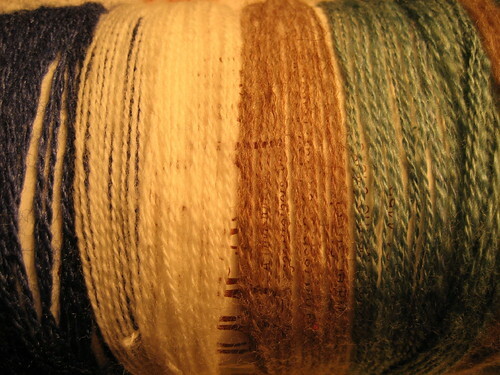 And comparing to some of the other stuff I've been sampling -- the brown stuff is a sample of the Foxhill Farms cormo/alpaca from MDSW; and the blue stuff is the laceweight from the last post. 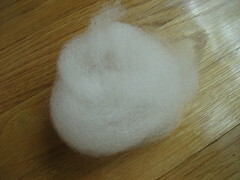 The cormo I washed was not hard to spin. There were bits that bunched up, but for the most part, it went pretty smoothly. 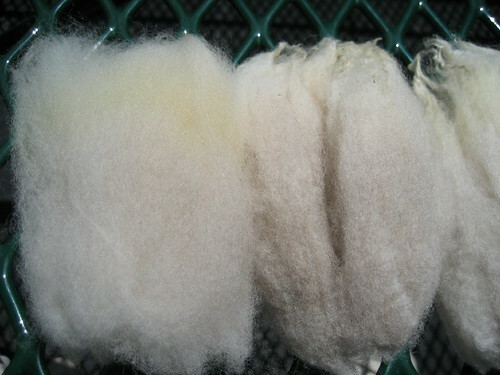 Comparatively, the cormo/alpaca was a little tougher to spin, but not bad. I definitely liked spinning my preparation better. The bombyx/merino was toughest of the three to keep consistent, but I didn't really pre-draft it. 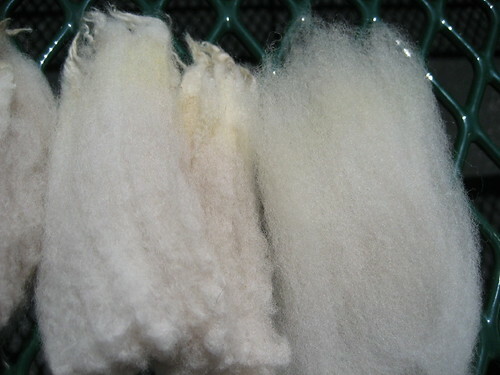 It's more handled than the other fibers from the dyeing, maybe that's part of it; maybe it's the silk. 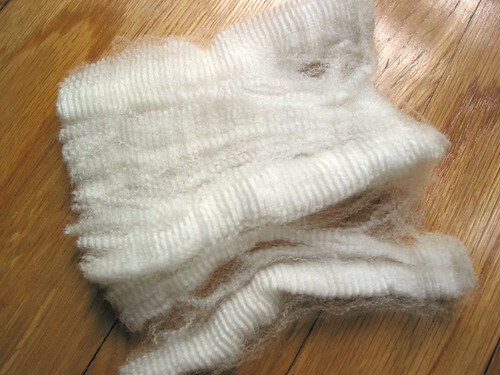 The cormo sample is about 8 yards, spun from a small portion of a lock. 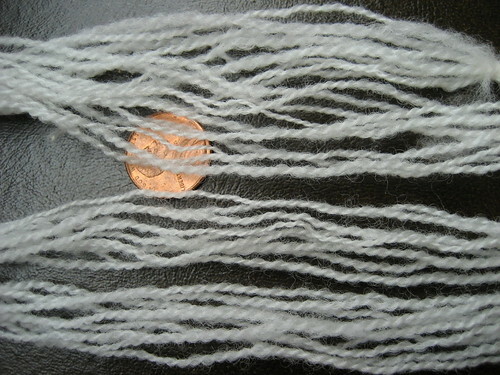 I think I'll spin up a larger sample at about the same grist and then knit up a swatch to see how it behaves. My eventual goal: to spin enough laceweight to knit a shawl. Ohhhhhh yeaahhhhhhhhhh. I'm glad so many enjoyed NH Sheep & Wool. Me, not so much. I don't know if it was the weather, the cold, the lake-like puddles, or the fact that I had already seen many of the vendors and that I wasn't going to buy anything because, well, because of the obvious. Maybe it was because I was already feeling out of sorts, between work, Gram, and sundry odds and ends. I'm glad I went, though. 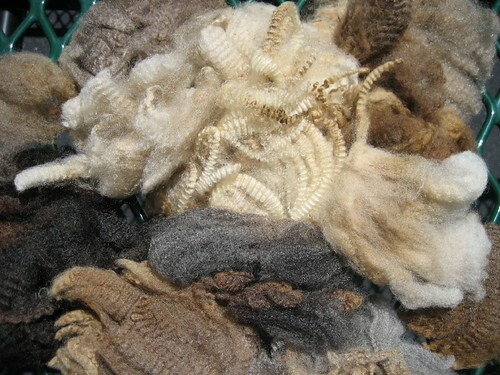 I saw Pam at her booth and Barbara with the fleeces, and enjoyed looking at the show and sale fleeces, seeing some new breeds (CVM for one), and being able to talk to Scott about fleece characteristics as if I knew something. (He was not so interested, though possibly somewhat impressed.) I also enjoyed seeing Erin and Cheryl, Carole and Stitchy, and meeting Kathy and Laurie. Sadly, I wasn't in a very social mood. I was happy wearing my yellow rain boots for the second time, and I was happy eating lobster rolls. Yup, plural. One for lunch, and one for the road. I even sang a lobster roll happy song on the way to the car. I was also happy to hang out with Scott on a mini road trip. Or is that Mini road trip? Driving conditions were suboptimal, but we did end up having a good time together. 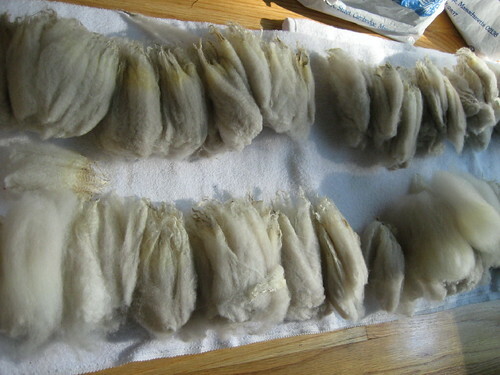 Over the weekend I tried my hand at washing some corriedale fleece. 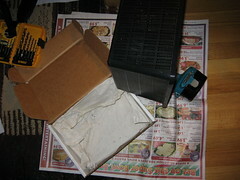 It was very clean and actually much nicer than I expected, once I opened it up. I tried a couple of methods, and overall, I'd have to say it was a sad exercise in repetition and inefficiency. In all I washed less than a pound, maybe 2/3 pound, at least twice. My methods were based on my own ingenuity as well as various instructions on the Internet, including Fiber Fool Kristi and Divergent Threads. What went wrong? Well, the first method (my so-called ingenuity) involved sandwiching fiber in those plastic mesh sheets you use for making tissue box covers. Interesting idea, not so useful in practice. I could only wash small amounts, and the sheets didn't fit well into my hot water containers. 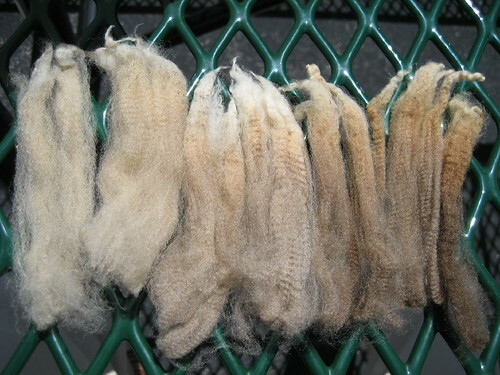 On the plus side, the locks and fiber orientation were maintained and the fleece came out very clean. 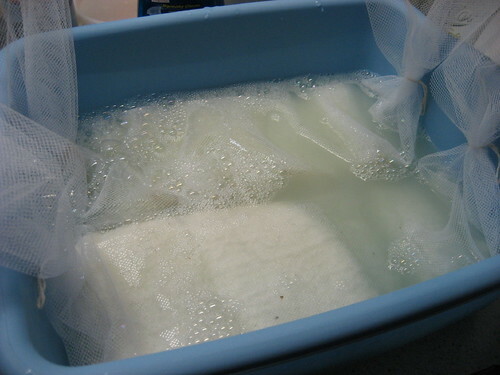 The second method involved a mesh laundry bag. The problem: I overstuffed and soaked it in containers that were too small. Hence, when I thought I was done, I found I was very wrong and had to go through a second washing with half again as much. It was a long night. 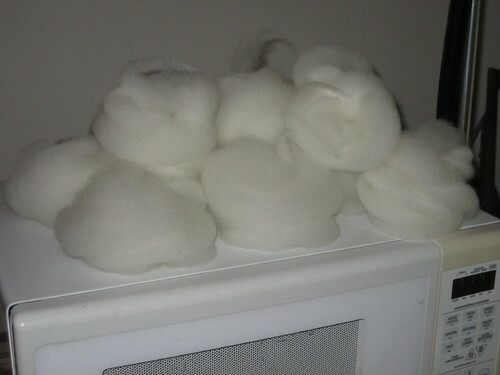 Despite the multiple washings and rinsings, I don't think the fiber felted. I tried combing some tonight but it didn't go as expected. I think I need to read up on combing some more. 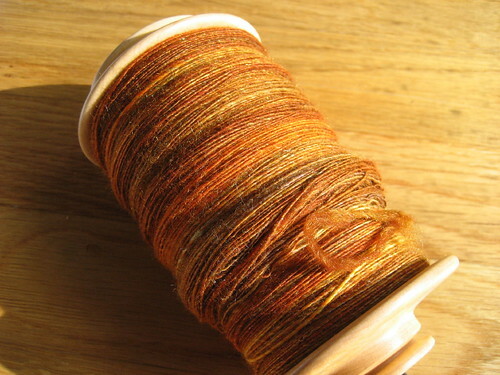 I've also been doing a bit of spinning, more on that tomorrow. Some good news: Scott started his new job today! We're very excited and relieved. His commute is TWICE as long as mine (ie, 12 minutes), but he does get to wear jeans to work. It's been a stressful many months since we were laid off so this is a good change. Life is a bit hectic and probably won't go back to normal for a little while. In good news, Gram is doing better. She fell several weeks ago, went into the hospital and then a nursing home where we thought she'd stay. But between a reduction in some medication and recovery from an infection, she's bounced back to better than she has been in months. She's moving around, she's not falling asleep, she's making conversation and jokes, she's a whole new woman. For now she's back at her apartment. It's good to see her doing better. She had a very sudden downturn for a while and now this sudden upturn. I haven't caught up yet! Thanks so much to everyone who sent well wishes and warm words, they were very much appreciated. 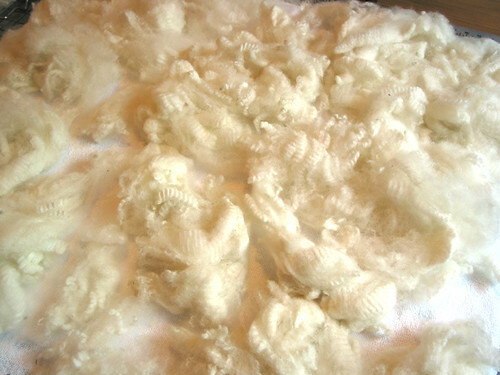 Here's the promised photo of the cormo fleece from MDS&W. Well, a lock. It's not the best pic; I'm still waiting for the sun to come out so I can take some more photos. Enough with the rain!